With the Tories projected to win 277 MPs and Labour 267, it’s virtually a dead heat and I don’t expect these kind of figures to change much between now and Thursday. It’s a cliche to say it really will come down to a few hundreds votes in a few dozen seats, but it’s a cliche worth repeating – even though in truth the same goes for every general election. You’ll see that I’ve left out Ukip. There’s no way they’d serve in a coalition with the Lib Dems (and vice versa). Some sort of semi-formal Tory-Lib Dem-DUP arrangement does feel more practical, if not particularly durable. Ukip would back such an arrangement if it meant there would be an EU referendum, of course, but their extra two or three MPs would not bring this bloc any closer to outranking the other. When you bunch together Labour, the SNP, the SDLP, Plaid Cymru and the Greens, you get to 327: one over the number needed for a theoretical majority, and four over the number needed for an actual majority (once you remove the Speaker and Sinn Fein from the arithmetic). Would a loose affiliation of these parties prove attractive enough for the Lib Dems to swap sides and support a Labour-led administration? Much may depend on how many – or how few – Lib Dems lose their seats on Thursday, including Nick Clegg himself. The media has made hay with the moral and constitutional legitimacy of a Labour-SNP deal, concluding with near-unanimity that it would be a disaster. But what about a Conservative-Lib Dem-DUP deal? What about the moral and constitutional legitimacy of that particular concoction? Much of the mainstream press has been gripped with a hysteria about all of this, particularly the role of the SNP. I take a more relaxed view. Whatever works will work. If it doesn’t, a way will be found to make things work. If that means another election, so be it. We’ve had minority governments before – as recently as 1996/97 – and the country didn’t grind to a halt. Scotland functioned perfectly well with a minority government from 2007-11. I actually think Ed Miliband came over as the most pragmatic of the main leaders on Question Time on Thursday when he spoke about simply putting a Labour Queen’s Speech to the Commons and taking things from there. The way things are shaping up, he may get the chance to do just that. But, as I argued the other day, David Cameron already has the upper hand. Whether he can be as pragmatic as his Labour counterpart may prove to be the decisive factor. I agree deal with SNP immoral and unconstitutional. However I think deal with LDs and DUP moral and constitutional as DUP is in favour of the UK whereas SNP does not believe in it. However I also agree LDs could change sides. 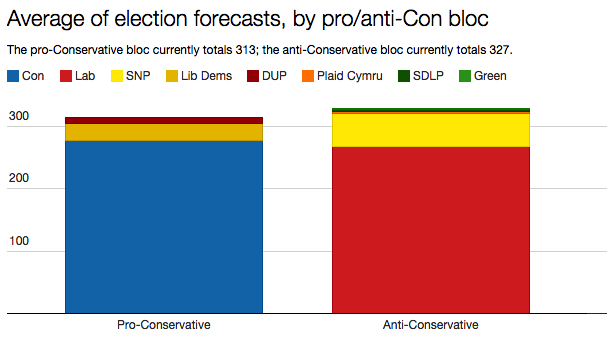 We still do not know whether Conservatives or Labour will have most seats as we await final polls in the next 4 days. What is unconstitutional is the idea that a bloc of MPs that have been democratically voted in by the electorate cannot seek power in a hung parliament. That would be a slap in the face to the 1.5 million-odd voters who put a cross by their party – and moreover would be seen as putting party first, country second. “Whatever works will work” – absolutely, so we should expect to see the Lib Dems working with Labour as much as with the Tories. House of Commons arithmetic prevented that in 2010 (aided by distinct hostility from some on the Labour side – see David Laws’ book “22 Days in May”). We should also expect a series of “Dutch auctions” by each of the smaller parties in whatever negotiations take place – why was Adonis so shocked by that in 2010? By my counting “the left” have to make around 50 gains from “the right” to win power… It does not really matter how many seats the tories gain from the LD, or lose to UKIP, nor how many seats Lab loses to the SNP… the seats that matter are the ones the Tories lose to Labour (around 35) plus the ones the LDs lose to Labour (around 10) and the ones the LDs lose to the SNP (around 10)… its possible, but close!! Sometimes seems like the only parties who haven’t ruled out a coalition or the Conservatives and Labour. Until we know the actual number of MPs for each party, all the talk about coalitions and informal agreements and red lines and so on is hot air. As Martin said, Labour could not form any kind of stable coalition with the Lib Dems in 2010 – a LibDem-Conservative agreement was the only way. Similarly, once we know the numbers this time, there may be only one viable alternative.